Travels with a Tin Donkey: Book Review: The Six Day Bicycle Races: America’s Jazz-Age Sport, or perhaps, They Shoot Cyclists, Don’t They? 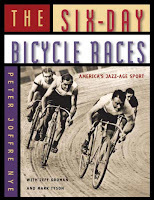 Book Review: The Six Day Bicycle Races: America’s Jazz-Age Sport, or perhaps, They Shoot Cyclists, Don’t They? Once upon a time, in a very different America where spectators wore suits and ties and really nice hats to sporting events, bicycle track racing reigned as the most popular athletic pastime in the land after the Black Sox scandal of 1919 turned the fans away from baseball. Basketball was collegiate and pro football was marginal but cycling drew the crowds, brought in the money --cycling star Bobby Walthour Sr. earned four times as much as baseball legend Ty Cobb-- and regaled the nation with its astonishing mixture of speed, danger, film stars, underworld figures and larger-than-life riders and promoters. On a Saturday night an army of carpenters would move into an empty arena or hall and typically assemble 60,000 board feet of high-grade pine or spruce into a track, ready to be used by Sunday evening, the air redolent with fresh-cut wood. By the following Sunday the track was gone, sold for firewood, and the circus headed to another location. And this circus, once front-page news, faded away with the Jazz Age, almost without a trace. Peter Nye’s latest book is a companion piece to the recent television documentary, “The Six Day Bicycle Races.” It is a very handsome work featuring a superb collection of photographs. Divided into twenty-six chapters, the book begins with the origins of the Six Day Races in England, its importation and enlargement in the United States, and goes on to provide profiles of stars including the Walthour family, Floyd MacFarland, Alf Goullet and Reggie McNamara as well as celebrated promoters Tex Rickard and John Chapman. There are fascinating insights into track construction, diet (stimulants were not unknown) and the work of the mechanics. 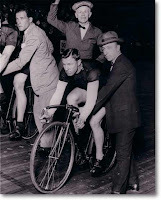 From this book, it seems that many of the participants were real characters: trainer “Roaring Jack” Neville–so named for his behavior after a few drinks– created stopwatch-based training in the 1890s, coached world champions for three decades and claimed to have never ridden a bike. In an era that produced dance marathons where participants danced until they dropped, it should be no surprise that track racing was brutally dangerous. In addition to dealing with tracks that were sometimes poorly designed so that control was difficult, riders had to contend with splinters, broken noses and collarbones, and occasional opponents who were not above fisticuffs. The cyclists rode in two-man teams and if one cyclist was unable to continue his partner would wait around and join up with another “orphaned” rider. Racers with broken bones paid their own medical bills. In the words of Reggie McNamara: “What else can you expect from a job like ours? If you can’t take it, you should try your hand at something else. This is a man’s affair.” Of course, the original Six Day Races were contested by solo riders until laws were enacted to prevent anyone from competing for more than twelve hours a day after complaints from spectators who watched exhausted cyclists tip over after falling asleep on their bikes. Promoter Bill Brady of Madison Square Gardens in New York created races with two man teams in 1898 and they became known as “Madisons,” setting the stage for three decades of colorful competition. With successful races in the United States, with an impressive degree of international rider participation, American promoters took the Six Day Races to Europe, where they met with huge success as well. But eventually the Damon Runyons and the James Thurbers stopped writing about the Six Day Races and interest began to wane during the Great Depression. The last Six Day Race at Madison Square Gardens took place in November 1939. But the story does not quite end there as the tradition of Six Day Races continues in Belgium, Switzerland and Germany, where the crowds drink beer and lustily cheer every brave attempt to lap the field. It is said that the silent movie is a unique art form in that it has a known beginning and a known end. So too was six day racing in America. This book, constantly filled with surprises and glorious pictures, is an excellent history of a sport that once was in a time so different from ours.